Let's just lay it out on the table here that I'm no bon bon expert. In fact, prior to these little guys, I don't know that I've ever had a proper bon bon in my whole life. They're usually just little round chocolates, right? And I've heard of ice cream bon bons. But sorbet? Heck, why not? The product development guys knew that as long as there was "mango" in the title, Big Joe was going to green-light the concept. Where's the Mango Cookie Butter, you guys? We're waiting on mango cookie butter here. 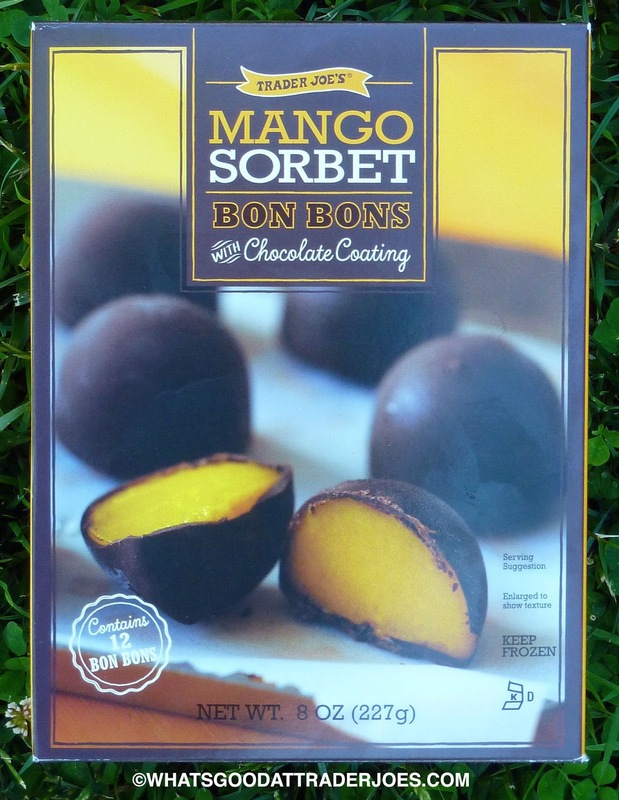 But seriously, the best thing these balls of chocolate and sorbet have going for them is their frozenness. 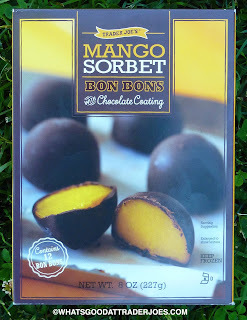 It has been quite warm here this past week or so, and I keep gravitating toward these bon bons if only because they're cold. And they're surprisingly low in calories, considering how indulgent they seem—just 90 for two bon bons. It's a very sweet sorbet that does indeed taste like real mango, but more sugary. Then they added a significant layer of deep dark chocolate. As far as refreshment goes, Sonia and I both wish we could have the sorbet sans the chocolate. We also think the flavor pairing is a little goofy, although we both agree that it has grown on us just slightly since our first respective bites. Of course, I'd like to try this sorbet with a milk chocolate shell. And even though it will never ever happen, like not in a million years, I'd like to try it with white chocolate, too. I guess I'm alone there. Every time I mention white chocolate around Trader Joe's types, I just get WTF's and blank stares. Such is my life. Sonia says she's "not a fan of morphing chocolate and fruit with the exception of chocolate covered strawberries." I'm pretty sure she means "mixing" chocolate and fruit. Marrying? Mingling? Merging? Meshing? Any of those would work. In Sonia's defense, she's fluent in Spanish. And I can't learn that confounded language to save my soul. But back to the bon bons. I think they were $3.99 for 12. 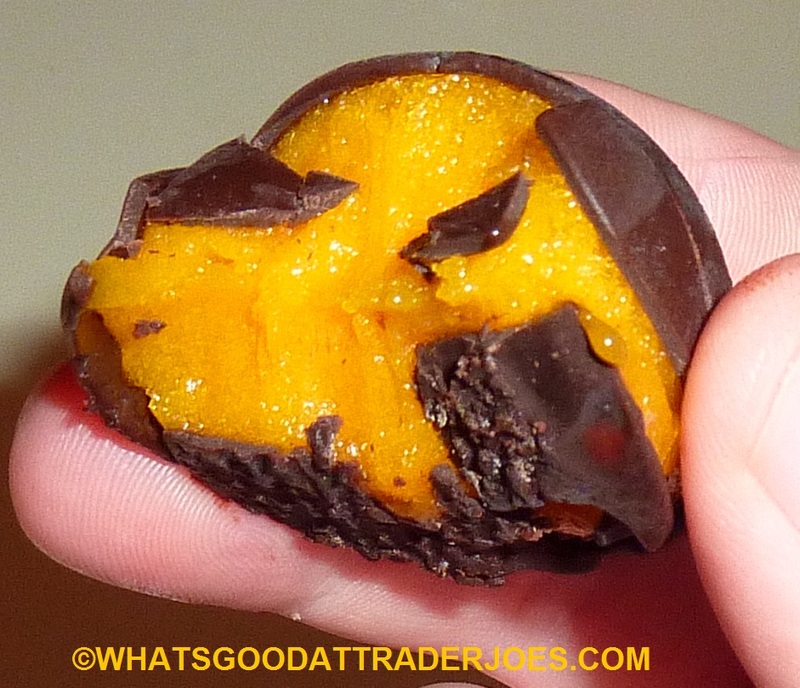 They're worth a whirl if you think mango and chocolate sound good together. Like I said, the sorbet is very good and very mangoey. I just think the chocolate clashes with it a little bit. I'll give this product three and a half stars. Sonia can't muster enthusiasm for more than three. So is this the same mango sorbet that they do sell by itself? I found that to be way too sweet, but amazing for making fake lassi or mango milkshake. I didn't realize they sold mango sorbet by itself. It's probably the same or very similar. I think that if they could had done similar concept with cookie butter ice cream and it would sell out fast. Mango, Red Onion, Cilantro, Jalapeño, Lime Juice (Water, Lime Juice Concentrate, Lime Oil), Sunflower Oil, Salt. MAY CONTAIN TRACES OF WHEAT, SOY, PEANUTS, ALMOND, PINE NUT, COD, SALMON, SHRIMP, TUNA. I just got my Fearless Flyer yesterday and it's loaded with mango products, even Mango Jo-Jo's sandwich cookies! I use their frozen mango pieces and plain Greek yogurt for making a very good lassi. These are vegan!! Woohoo! I love the mango sorbet- which is sweet but tastes like a ripe mango. Dunno about fruit and chocolate combo here but i'll try it! I thought these were AMAZING! 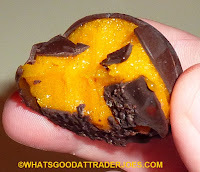 These mango/chocolate bonbons were AMAZING! unfortunately, I was there today specifically to get these and they are GONE . . .OMG!